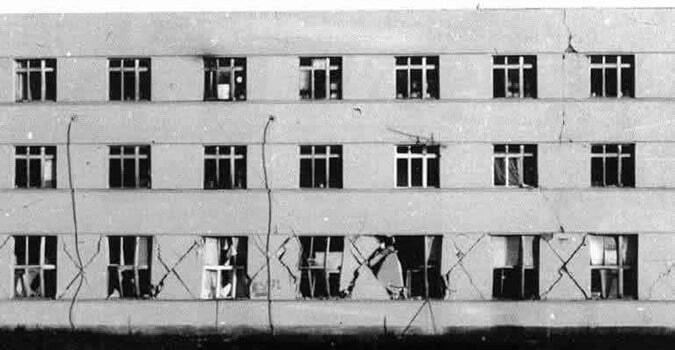 There are various causes for various types of cracks in masonry buildings such as in walls, foundations, slabs, columns. 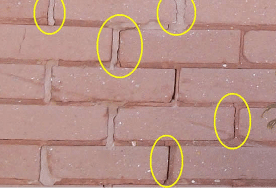 Repair methods of such cracks in masonry buildings is discussed. There are certain problems in structures that arise suddenly. Some problems like crack formation or settlement of foundation won’t give a caution before it appears. Most of these problems arise due to improper construction method and carelessness during initial construction. So, care during initial stages can help avoid such problems that require huge maintenance. Cracks are observed below the load bearing walls, mainly those that supports R.C.C slabs. Now the temperature variation makes the reinforced concrete slab to expand or contract, but both in the horizontal direction. These are observed in the Top most story that is more exposed to the temperature changes. There no smooth contact between the wall and the slab. Hence the frictional forces are developed at the contact place of the wall and the slab. This creates cracking in the walls. The precaution that can be suggested is to provide a bearing plaster over the brick wall, which helps in having a smooth contact with the floor over it. If required a bituminous coating can be applied over the plaster applied. Improper bonding between the cross wall and the main wall creates cracks between the joints. This suggests us to have proper and quality bonding between the two walls. These are properly done by toothing. One of the main reason behind this is the differential movement of the columns and the masonry because of temperature variation. This variation can be either expansion or contraction depending upon the temperature. These cracks can be hidden by making a groove in the reinforced concrete column and masonry junction. The provision of chicken wire alternatively at the plaster between the junction of columns and masonry can also help in this variation. The non-projecting slab is mainly subjected to such cracks. This too is due to the temperature variation and the drying shrinkage. Small micro cracks formed he propagated with the increase in expansion or contraction. These cracks can be hidden by making a groove at the masonry junction will help in hiding the cracks. The provision of chicken wire alternatively at the plaster junction can also help. 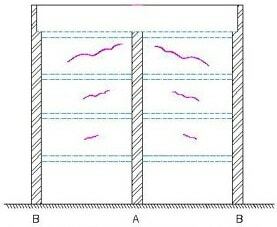 The exposure of roof slab to higher temperature variation cause cracks numerously. This can be reduced by providing a weather proof course. New treatment methods and compounds are available as weather course, that is applied over the terrace. Application of grouting or uniting for cracks that are appeared in the main structural members, that cannot be compromised at any cost. The material mainly used for this is either cement or epoxy mixture. The epoxy has the ability to fill even small and thin cracks, say as fine as 0.1mm. These epoxy gain high strength and adhesion. The flexible sealant can be used for cracks that are appeared on the non-structural members. This helps in having a control over the differential movement (expansion or contraction) of the member under temperature changes. Epoxy putty, polymer filler or lime cement mortar can be used for filling the cracks seen in plain cement concrete. Gradual raising of foundation and wall has to be made, for letting the structure to have an allowable settlement. The settlement value of should not go beyond allowable, under any combination of loads. The foundation designed should facilitate uniformly distributed pressure on the soil. The unequal settlement of plinth is avoided by removing expansive soils like black soils (black cotton soil), nearby plinth. This barrier is kept with the help of sand harries. Providing drains and flagging concrete help in avoiding rainwater away from the plinth. The penetration of roots into the plinth has to avoided. This can be avoided by stopping the construction of trees that has lateral growing roots nearby.